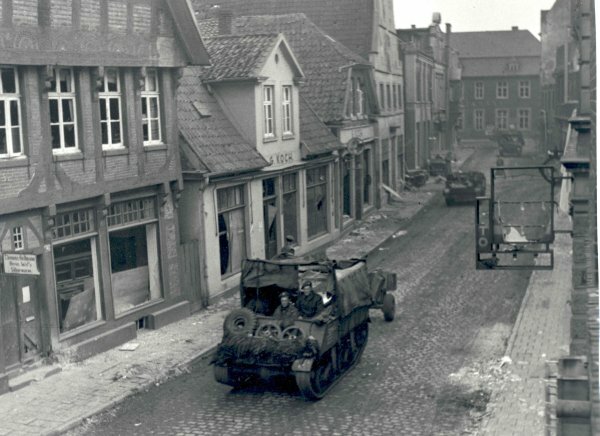 On April 6th., 2 RUR was given the task of passing through 2 Warwick at first light in Lingen to clear a sector of the town which lay astride one of the main routes out of it.The intention was to consolidate a vital cross-roads on the outskirts of the town. This would allow the Guards Armoured Division, scheduled to cross the bridge over the canal at 0800 hrs, the same morning, to pass through and exploit our success.In all, the distance to be traversed was about 1500 yards, 2 Warwicks were based upon the line of the Lingen railway, with one company forward of it across a subsidiary road which was to be the start line. The main road ran East from the railway out of Lingen, and at this cross-roads met a subsidiary road running out of South Lingen in a North Easterly direction. This road was to be the scene of bitter fighting when the attack began. Little was known about the enemy as, after a counter attack by German infantry and SF guns had been made against 2 Warwick on the day before our attack, contact had been virtually lost.The Boche was known, however, not to have quitted the town, and was expected to defend all main routes out of it. A patrol from 2 Warwick knew that a house only a short distance from their forward troops, along the main axis, was occupied by the enemy.The plan was as follows. „C“ Company was to capture the vital cross-roads by pushing, not down the main road, but in a right flanking direction, coming up to the road junction along the secondary road. The chief opposition was expected on the main axis, and it was hoped by this bold plan to cut their line of withdrawal. Once „C“ Company was established, „A“ Company were to advance straight up the main road, clearing the houses and driving the enemy against the firm bed of resistance provided by „C“ Company on the road junction. Subsequently „D“ Company was to pass through „C“ Company to consolidate forward and right, and „B“ Company was to clear any houses that „C“ Company had left unsearched in their advance to the cross-roads. The Commanding Officer’s orders to Capt. Barry, in command of „C“ Company, were simple and direct. It was to get on to the cross-roads by a circuitous route, straightaway, without clearing more houses than was necessary to get forward rapidly. In support, Capt. Barry had a troop of Sherman tanks, and three Crocodiles, and his Company was to „marry up in the market square and move forward in pre-arranged order. Lt Purcell’s platoon led the way, and his advance was, in the initial stages, without incident. When he was about 300 yards from the Company objective, however, shots were fired from a house on the right hand side of the road about 100 yards up. The leading section went to ground and, under cover of its fire Lt Purcell immediately pushed the next section around the back of the houses on the left side of the road, in order to maintain the momentum of the advance. This apparently sufficed because by the time this reached a point level with the shooting, all was quiet; so they pushed on. No further trouble was experienced by this platoon until the leading section reached the cross-roads, when vicious machine gun fire came from a house on the South side of the main road about 75 yards away. The first section was pinned down not only by this fire, but by some sniping from a house 50 yards down the main road beyond the cross-roads. So too was the second section, attempting to approach the house directly from the south. Cpl Watkin in a fearless and gallant rush for the house was unfortunately killed, and casualties were inflicted upon his section. Meanwhile the third section had come up, and was also pinned down by the withering MG firing from this house. At this point Lt Purcell signalled to Capt. Barry, and explained the situation in full when he came up. They were just deciding upon a plan for the use of a second platoon with Crocodiles, when five or six men were observed moving by leaps and bounds from the house which was holding out so stubbornly. They were furiously engaged by the rear section of Lt. Purcell’s platoon and with particular skill and devotion by Rfn Scott, who accounted for at least three of them. But two managed to infiltrate to Platoon HQ and, before being killed, one succeeded in shooting Capt. Barry, mortally wounding him. The situation was now serious. The forward platoon was thoroughly pinned down to the ground, which was dominated by houses which had not been searched. The enemy might have been anywhere, even in the houses along the company axis of advance; and where he had been located he apparently was in sufficient strength to undertake aggressive action. Moreover, if the general plan was to be successful, it was imperative that „C“ Company should win their objective, and win it quickly, and this they seemed still far from doing. Such was the situation when Capt. Alexander, second-in-command of „C“ Company, took over command. Spending a few quick minutes with the forward platoon to get acquainted with what had happened, he then turned back to Company Headquarters to unleash the Crocodiles against these fanatically defended buildings. But bad luck was to play its part. In attempting to manoeuvre into position, the flame-throwers left the road and immediately sank into a soft and boggy stretch of ground and were unable to move. Undeterred by this disaster, Capt. Alexander formed up his second platoon, under Lt Fairman, for an attack on the house under cover of an AP shoot from one Sherman 17 pdr. Here again, bad luck appeared to dog his efforts. The first shots from the Sherman, unknown to the gunner, touched upon the branches of a tree which overhung the bank, and burst amongst the platoon causing casualties and some demoralisation. This platoon quickly reorganised and moved forward, but it too was pinned down by fire from a house close by the other. Notwithstanding these reverses, Capt. Alexander determined to reach his objective. 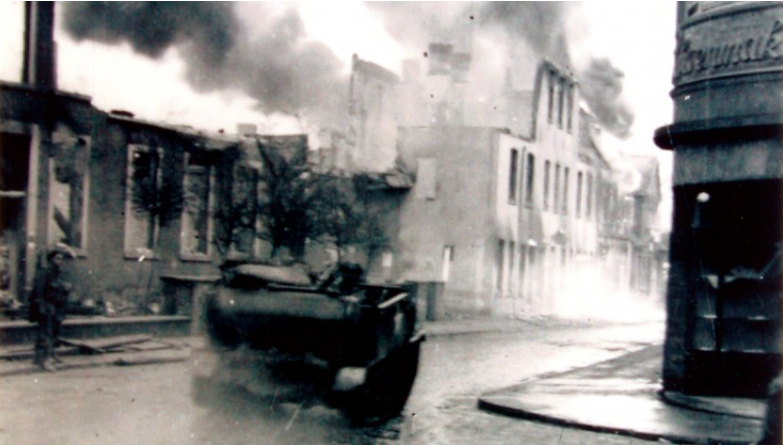 He now pushed his third platoon Northwards to the main road, ordering it to work along towards the cross-roads on the right hand side, clearing all the houses up to the Company objective. Covering fire was provided by the Shermans and the other two platoons, and this time Capt. Alexander’s plan was blessed with success. Houses were cleared, some 25 prisoners taken, and this third platoon under Lt Harris was able to establish itself well beyond the company objective. „A“ Company, who had already begun the advance along the main axis, now proceeded merrily on their way. The success of their house clearing was now ensured due to the stop which „C“ Company had built across the German’s line of withdrawal. Prisoners began to dribble back to Battalion HQ. The objectives were soon made and consolidated. Then a patrol under Lt Songest was sent forward to contact „C“ Company. Working his way forward about 200 yards he suddenly came under fire from a party of Germans in some houses close to those which had been troubling „C“ Company. In taking cover some casualties were sustained, so without further hesitation Lt Songest decided to attack. Under cover of a smoke grenade and covering fire from the patrol, he advanced with a small party under intense small arms fire, threw a grenade through a small aperture and, forcing open the door, compelled the enemy to surrender. Casualties were sustained and Lt Songest, was himself grazed in the neck by a bullet. 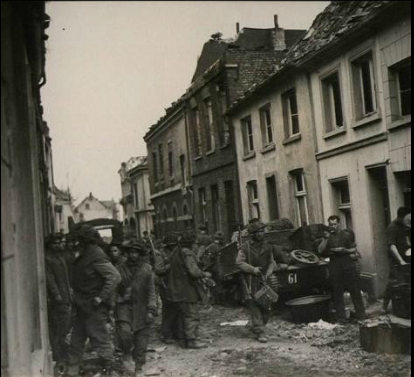 But 60 prisoners were tumbled out of these houses, and this finally cleared the way through to „C“ Company. While this was going on, „D“ Company was passing through „C“ Company to reach their objective without opposition. The Commanding Officer was now ordered to send one Company to occupy a triangle of roads on the Battalion’s right flank, some 600 yards due south of „D“ Company’s new position. „B“ Company under Major Cummins with one troop of Shermans, was accordingly directed to this task. The position was quickly reached and consolidated, and only when a small patrol was sent to investigate a house in front of the forward position did the trouble begin. As the patrol approached the house, a spandau opened fire from the edge of a large wood which extended a great distance behind the house. This caused casualties, among whom was L/Cpl. Glover, the patrol commander, but in spite of his wounds he retained control, extricated his men, and explained coherently and accurately on his return the position of the gun before being evacuated. The reserve platoon was now brought up with two Shermans, and while these gave covering fire, an assault was put in with great dash by Lt McCrainor’s platoon killing one, wounding two and capturing one German, putting two others to flight. Patrolling forward a little further, this platoon was fired on, and two more spandaus were encountered, though fortunately the wood now hindered their field of fire. Just as an attack on these positions was being prepared, information was received from Brigade that the wood was probably held in considerable strength; a substantial part of 7 Para Division was believed to be in it. The Commanding Officer gave orders that the engagement would be broken off and the company would pull back to its original position. Subsequent information from POWs revealed that when the tanks moved up to begin the attack on the two spandaus the enemy, who were indeed in fair strength, withdrew, although it seems probable that they returned some time later before finally evacuating during the night. At any rate they took no further action against our troops. This phase of Lingen had produced bitter, lethal fighting. These fanatical Germans asked no quarter and received none. Hand to hand fighting in which our men – stimulated by unexpected resistance – got to close grips with the enemy, took place and the bodies of the Germans lying within a few yards of our own wounded and dead grimly testified to the fierceness and severity of the fighting. We lost a brave leader in Captain Barry, and several soldiers that day. But „C“ Company could be proud of the fighting spirit it had displayed and none was later surprised to hear that Capt. Alexander, who had led them to success, received the immediate award of the Military Cross for his part in the operation. The Guards Armoured Division were by now streaming through our positions along both the main roads which ran away from „C“ Company’s cross-roads. But a few miles further down they were held up by the usual chain of mines, demolitions and craters. 185 Brigade were now brought forward again to take over the perimeter defence of East Lingen releasing 9 Brigade to initiate a second attack South from Lingen in order to open up a second axis running East to west across the River Ems and canal five miles further South. 2 RUR was relieved at 1800 hrs. by 2 Warwick, and by 2000 had returned once more to the centre of the town for a night in concentration. At 0700 hrs. we had been ordered to pass through the Lincolns who were covering the Southern approaches to Lingen, and secure some high ground 1500 yards further on the South side of an excavated canal. The day had begun for most people at 0400 hrs. and had been occupied with a tiring battle which had lasted several hours with a move at the end of it. Now it was well past midnight before orders and preparations for the next day were complete, and at approximately 0400 hrs. people were required to be up in readiness for the day’s work. It was indeed a testing routine. The latest information about the enemy was disclosed at a Brigade O Group held at the forbidding hour of 0400 hrs. 7 April. Patrols from the Lincolns had closely investigated the wood in which it was thought that large numbers of 7 Para Division were lurking, and had found nothing but abandoned equipment; they heard absolutely no sound of foreign occupation. Later a civilian was brought in who said that during the night the enemy had pulled back from these positions in an Easterly direction. The advance of 53 Welsh Division North East from Rheine had made this move probable, and it seemed likely that 7 Para Div. had now been switched from the South to cover the Eastern exits from Lingen. 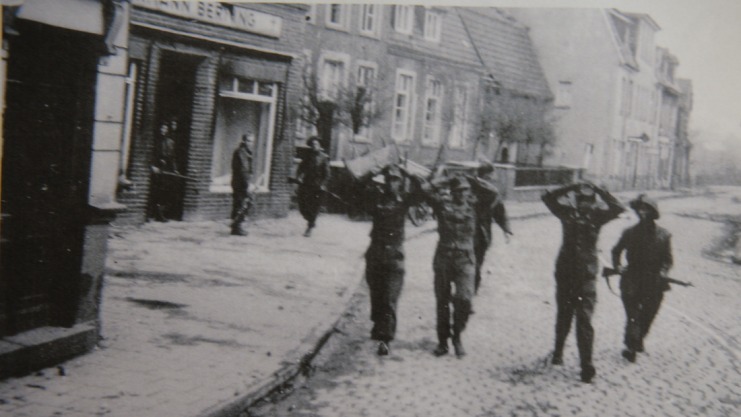 Das oberste Foto zeigt britische Truppen in Lingen, so sagt es die Internetseite der Royal Ulster Rifles, wobei ich meine Zweifel habe, weil ich die Straße und die Häuser nicht zuordnen kann und auch ein weiteres „Lingen“-Bild auf der Seite zu sehen ist, das mE keine Aufnahme aus Lingen ist, wie man am Kirchturm erkennen kann. 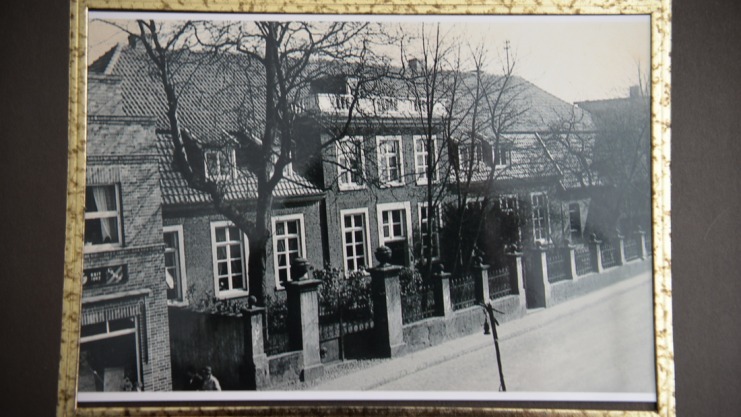 Das zweite Bild von oben zeigt die Gefangennahme von drei deutschen Soldaten am Andreasplatz/Lookenstraße, links das Berning-Haus, in dem sich heute die Andreas-Apotheke und die Lohner Landbäckerei befinden; im weiteren Verlauf der Kämpfe brannte das auf der linken Seite sichtbare Stüting’sche Haus aus. Dazu hier die Privataufnahme vor der Zerstörung, die die NOZ/LT veröffentlichte. In der letzten Woche stellte sie die Frage nach dem konkreten Grund. Der Regimentsbericht der Royal Ulster Rifles nennt ihn. Die Folge zeigt die dritte Aufnahme. 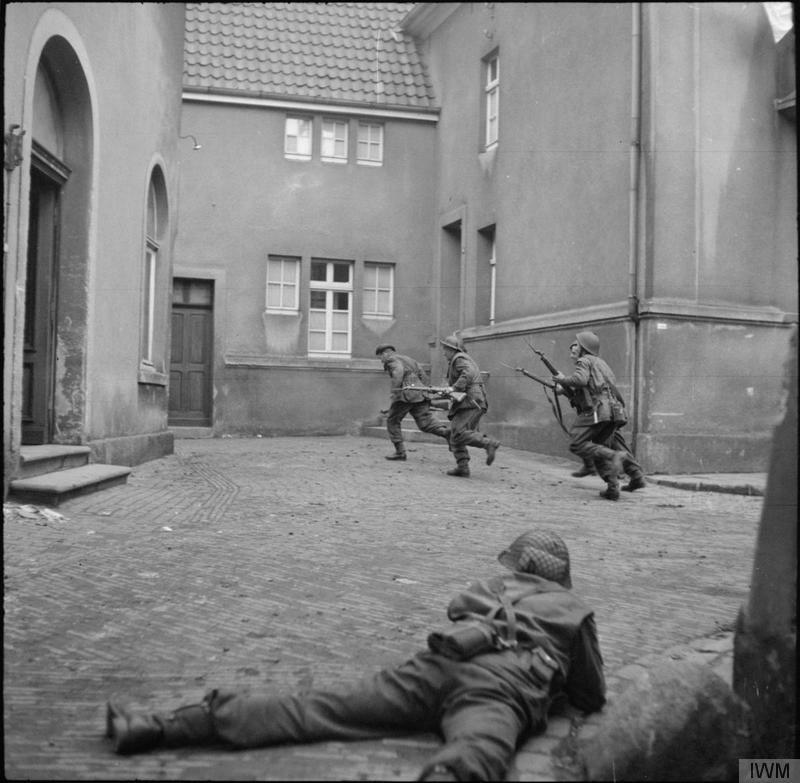 Das vierte Foto zeigt britische Soldaten in der Burgstraße vor dem ehem. Schuhgeschäft Harmeling (jetzt HollyBack). 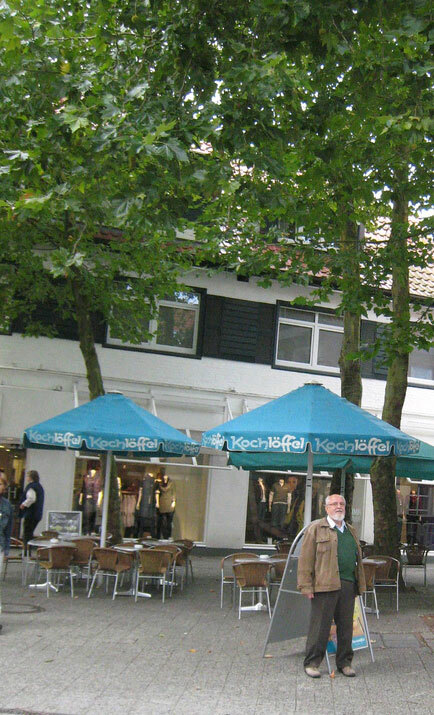 Der Blick geht am zerstörten Block Burgstraße/Am Markt vorbei auf die ehem. Kreissparkasse, die 1969 abgerissen wurde. Das fünfte Bild ist aus dem Haus Burgstraße 18, der heutigen Targo-Bank, aufgenommen; vorn links das Hellmann’sche Haus Burgstraße 13. Unbedingt möchte ich an diesem Wochenende noch etwas zum „Haus Berning“ schreiben. Das Gebäude am Andreasplatz ist umgestaltet worden, nach dem die Eisdiele Ende 2010 geschlossen hatte. 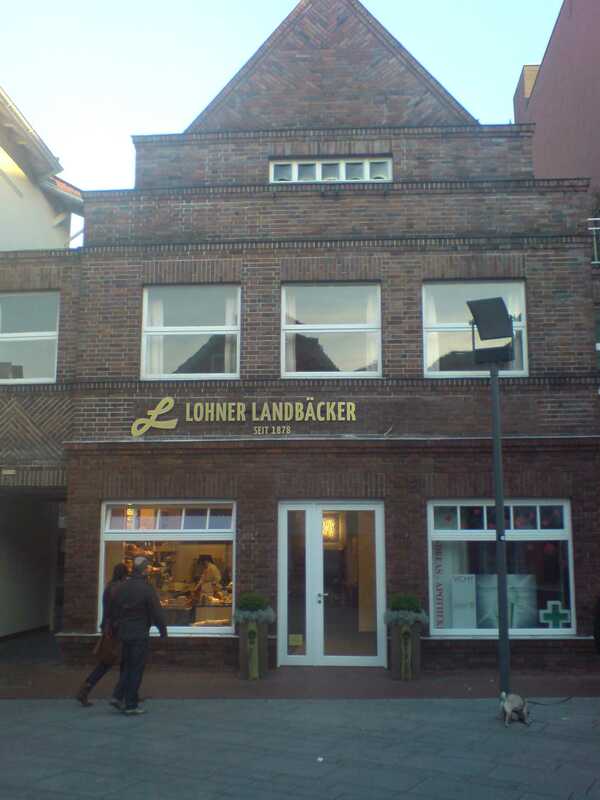 Jetzt hat der „Lohner Landbäcker“ mit einem Café eröffnet, daneben weiterhin die Andreas-Apotheke von Apotheker Thomas Albers. Pünktlich zum 80-jährigen Umbau hat die Erbengemeinschaft Berning damit ihrem Haus das Gesicht zurückgegeben, das ihm vor einigen Jahrzehnten bei sog. Modernisierungen abhanden gekommen war. Entstanden war dadurch in den 1960er und 70er Jahren das, was im Lingener Stadtrat immer als „Frau ohne Unterleib“ bezeichnet wird und man auch an anderen Stellen im Stadtbild findet: Eine Hausfassade, die nach vermeintlich ökonomisch-optimierter Giebelmodernisierung den Charakter des Bauwerks zerstört und seine architektonische Gestaltung nurmehr aus den unveränderten Obergeschossen erahnen lässt. Unter der Verantwortung von Architektin Petra Berning hat das Haus Lookenstraße 12 jetzt das Gesicht wieder gefunden, das es 1931/32 anlässlich seines ersten großen Umbaus erhalten hatte. Zuvor stand hier im Bereich der 1632 abgetragenen Stadtbefestigung ein kleines eingeschossiges Haus. Malermeister Berning erneuerte dessen Außenwände und überbaute die zum Haus Lookenstraße 10 gelegene Durchfahrt. Das Haus selbst stockte er auf und zu guter Letzt erhielt es (s)einen neuen Giebel. 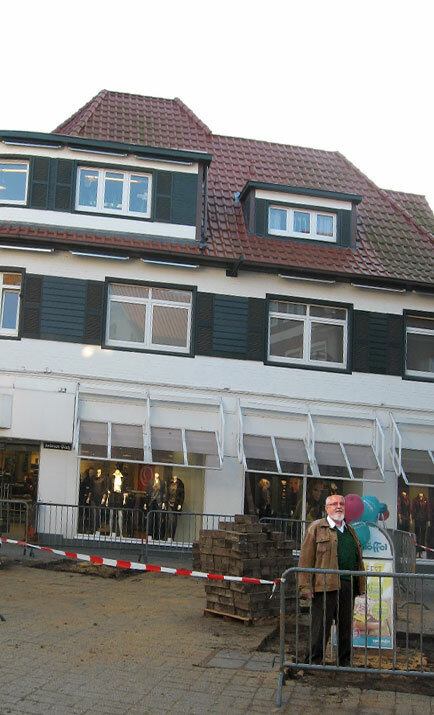 Die Fassade gestaltete wohl der Lingener Baumeister und Architekt Gerhard Lühn, der zwischen den beiden Weltkriegen so manches prägendes Bauwerk in Lingen und der Region gestaltet hat. Der jetzige Fassadenrückbau verzichtet auch auf die in unserer Stadt auch so beliebte Brüllwerbung. Im wahrsten Sinne des Wortes glänzt jetzt eine Messinginschrift, die man so manchem Gebäude in Lingen wünschen würde. Ein gelungener Beitrag zur Stadtgestaltung!